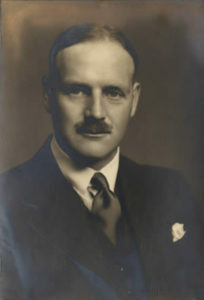 Colin Ellis was born near Uppingham, Leicestershire, into the Ellis family one of the most important Leicester families of the 19th and 20th centuries. The grandson of the 19th century railway pioneer and industrialist John Ellis, Colin Ellis followed his father, Bernard Ellis JP (Lit and Phil President for 1916-17), into both the family business and also into the Lit. and Phil. (joining in 1923 and remaining a member for the rest of his life). At the same time he pursued his life-long interest in both local history and literature – he was a noted writer and poet of the period, and he was the Joint Local Secretary for the 1933 Leicester Annual Meeting of the British Association for the Advancement of Science, and the President for the Lit. and Phil’s Centenary in May 1935. He brought to this office his knowledge of the history of the city and county that was unparallelled in his day. This was reflected in a presidential address that explored the social, political and economic state of Leicester and Leicestershire around the time of the formation of the Society in 1835, complementing the account of the origins and founding of the Society in the official Centenary history: F.B. Lott’s Centenary Book of the Leicester Literary and Philosophical Society (1935). Mr. Colin Ellis died on 4 July 1969. He was elected a Vice-President of the [Leicestershire Archaeological and Historical] Society in 1937. He succeeded Sir Robert Martin as President in 1961, and on his retirement in 1966 he became President Emeritus until his death. Colin Dare Bernard Ellis was born in 1895. His great-great­grandfather, Joseph Ellis, was a Quaker farmer, who established the family in Leicestershire as an immigrant from Yorkshire. His two sons were both men of note: John, who became Chairman of the Midland Rail­way; and Joseph, the founder of the well-known firm of coal and builders’ merchants Ellis & Everard. Colin Ellis was descended from Joseph. He was educated at Bootham School, York, and King’s College, Cambridge. He joined up in 1915, and served as a Lieutenant in the Leicestershire Royal Horse Artillery throughout the remainder of the war. He was mentioned in despatches, gained the Military Cross, and was severely wounded. On his return from the war he joined the family business. In 1922 he married Ethel Clarke, [daughter of Dr Astley Clarke, the co-founder of the Leicester University College]. In the Second World War he became Director of Home-Grown Cereals in the Ministry of Food, which involved a four years’ residence in Colwyn Bay. He became Chairman of Joseph Ellis & Sons Ltd. in 1944 and of Ellis & Everard Ltd. in 1952, serving in both offices until 1963. He was President of the National Association of Corn and Agricultural Merchants in 1953 – 54 and was appointed C.B.E. in January 1955. Throughout these years he gave varied public service to the city and county of Leicester: as Vice-Chairman of the Governors of Wyggeston’s Hospital, for example; as a Trustee of the Leicester General Charities and of Bradgate Park; as a member of the Council of the University College and for a time as Chairman of its Finance and General Purposes Committee. But his most distinctive contribution was made to the visual arts and to archaeological and historical studies. He had, for more than twenty years, been a co-opted member of the Museums and Libraries Committee of the City Council. As Chairman of its Arts Sub-Committee he gave time and thought and the fruits of his good judgment to the purchase of pictures for the City Art Gallery, which owes perhaps as much to him as to any other one man save Alderman Squire. He played a very active part in the production of its admirable catalogue Local Portraits (1956), to which he contributed a series of pithy biographical notes that are a model of their sort. When, early in 1936, the archaeological investigation of the Jewry Wall site in Leicester came under discussion, Ellis was chiefly responsible for forming the Excavations Committee, which represented many interests, and became Chairman of the Executive Committee that did most to support Miss Kathleen Kenyon in her work and to prepare the ground for the City Council’s enlightened decision to preserve the site as an open space. In the Introduction to her report Miss Kenyon paid a handsome tribute to him and to the Secretary of the Committee, W. K. Bedingfield, to their diplomacy and to their “great kindness and inspiring enthusiasm”. The tribute went beyond convention and was well merited. Ellis was indeed always at pains to help those who were seriously engaged in the wide range of studies that interested him. A question on some point of detail would draw from him a letter of two or three pages, in his admirably clear handwriting, giving references and arguments, not infrequently offering to pursue the matter further if he could. Such kindnesses came from him all the more generously in his later years, when he was burdened with long ill-health. It was the Jewry Wall excavations that first brought Ellis into contact with the Leicestershire Archaeological Society. After the war he became closely involved in its work, occupying the onerous and sometimes troublesome office of Chairman of its Committee for two years (1955 – 56). More than local recognition came to him in 1940 when he was elected a Fellow of the Society of Antiquaries of London. He gave good service, then, in a variety of ways to the community and to individuals within it. But he will be most widely remembered as an author. The historical writing Ellis produced falls into two divisions: the brief contributions he made to co-operative work and his own three books. His earliest published essays in this field are to be found in the admirable Historical Guide to the City of Leicester produced in 1933 when the British Association met there. The first part of that little book was written by S. H. Skillington, with all his characteristic terseness and point, taking the story down to the close of the seventeenth century. Ellis’s contribution was no less dear and elegant. In twenty pages he sketched the city’s modern history and provided a compact account of “the way about Leicester”. Two years later he selected from his mother’s remin­iscences — “my rag-bag”, as she called it — the material that made up her Records of Nineteenth-Century Leicester: a compilation that social histor­ians will always use with profit. Later he rendered other useful and self-effacing services of the same kind. It was essential that the third volume of the Victoria County History should include a good account of hunting, the activity for which Leicestershire is pre-eminently famous. Unfortunately Major Guy Paget, who had agreed to write the chapter, died in 1952 before it was finished; Ellis shaped up the material that he left, adding to it his own account of the Quorn Hunt and making it all into a coherent whole. Next he supplied his distinctive contributions to the two catalogues of pictures that have already been mentioned; they were published in 1956 and 1958. In the later years of his active life he spent much energy in recording monumental inscriptions in the churches aid chapels of the county, and their graveyards. This work was not published, but the notes for it are deposited in the Archives Department of the City Museums [now the Record Office for Leicestershire, Leicester and Rutland]. They form a valuable quarry for students of history, and will become more valuable — like the similar records made by Nichols and his collaborators nearly two centuries ago— as the originals come to be obliterated by time and chance. There remain the three books. Two came out in the same year, 1948. The first of them was privately published: a brief but extremely workman­like centenary history of Ellis & Everard Ltd., making good use not only of the firm’s own records but also of the diary of James Ellis, his great-great uncle, to show very clearly how the business was built up by a combination of hard work, enterprise, and meticulously economical management, side by side with the extension of the railway system. The other book of 1948, History in Leicester, combined in one interesting pattern three elements: narrative, the contemporary comment of observers in the past, and architectural description. All these were skilfully fused together, and lie book was clothed in a form worthy of it, to be sold by the City’s enter­prising Publicity Department at a very reasonable price. A new edition of the book, including some supplementary matter contributed by others, appeared in 1969 — unhappily, just after the author’s death. It remains one of the most attractive achievements in presenting local history to the ordinary reader that any English town can show. Leicestershire and the Quorn Hunt was his biggest book, and in some respects the most important. It breaks firmly away from the usual patterns of sporting history, replacing the traditional account of the dynasty of Masters, interspersed with strings of jolly and breathless anecdotes, by critical and accurate research, designed “to show the Quorn Hunt against a local background”. Ellis always appreciated the importance of “back­ground”, of relating the events he described and the people involved in them to the larger world of which they were part. History in Leicester constantly reminded its readers of the relationship between this one Midland town and the larger polity of England. In just the same way, he displayed the Quom Hunt not simply as a sporting enterprise but as some­thing that grew up in a particular countryside; hunt and countryside impinged on each other, and that lay at the heart of Ellis’s story. His acquaintance with the country he was dealing with was exceptionally intimate: for he not only rode to hounds, he knew about corn, he appreciated the landscape with something of a painter’s eye and he understood its history. The first appendix to his book, “Some Covers and Landmarks”, is an invaluable contribution to Leicestershire topography. At the same time he never distorted his story by claiming the Quorn wholly for Leicestershire: he saw the exotic elements too, and he often did memorable justice to ‘them. It is this range of interest, the sense of scale, proportion, and depth, .that most of all distinguish the historian from the antiquary. Ellis was emphatically a historian. But he was something else too, which made him, among historians, a rarity indeed. He was also a poet. His first historical essay appeared in 1933 when he was nearly forty. Before that, however, as a younger man, he bad written a substantial number of short poems, which he had collected together in two small books. The first of them, The Dispassionate Pilgrim, was a thin paperback, published by Blackwell at Oxford in 1927. The second, Mournful Numbers (Macmillan, 1932), reprints all but half-a-dozen of the first collection and adds some more. These additions include nearly all the best, suggesting that he found his feet as a poet between the appearance of his first book and his second; and since there was never a third we may infer that he felt he had then had his say. Immediately after Mournful Numbers was published, he turned to writing history in prose. The wry titles of these two volumes give at once a clue to the character of what they contain. Their chief themes are dislike and pleasure. The dislike is not hatred—more often it borders rather on distaste. But it is concentrated into a number of mordant epigrams, which owe something to Herrick and by no means disgrace their parentage. A few of them reflect the political despair of the time. Presidential Address: President’s Address. Transactions LLPS, vol. 36, pp. 5 – 25.